In the early 1970s, the Soviet Army sought a replacement for the 9K72 Elbrus (SS-1C `Scud B') system, which had a very slow reaction time [around 90 minutes to prepare and fire] and poor accuracy when using conventional warheads. The replacement system, codename 9K714 Oka (Russian: OTP-23 «Ока»; named after Oka River), was developed by KB Mashinostroyenia (Machine Industry Design Bureau) in Kolomna. The new 9K714 system featured a faster reaction time and used the low-maintenance solid-fuel 9M714 missile. The 300 km range of the R-300 (`Scud') was surpassed by the 400 km range of the 9M714/R-400. The OTR-23 Oka was a mobile theatre ballistic missile (Russian: оперативно-тактический ракетный комплекс) deployed by the Soviet Union near the end of the Cold War. It was assigned the NATO reporting name SS-23 Spider. The introduction of the Oka significantly strengthened Soviet theatre nuclear capabilities as its range and accuracy allowed it not only to strike hardened NATO targets such as airfields, nuclear delivery systems, and command centres, but moving targets as well. The SS-23 has a range of 500 kilometres, with speed of Mach 9 (11 000 Km/h) that can access most locations in a given theatre of war. It also had a fast reaction time, being able to fire in approximately five minutes, and was nearly impossible to intercept, thereby allowing it to penetrate defences. 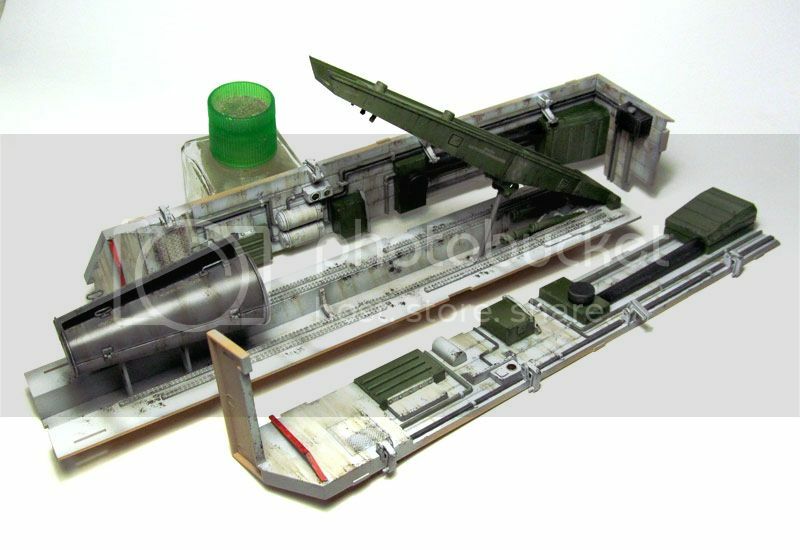 The 9M714 has a full sprue (F) where the missile is represented with half parts where the engine parts are molded as single parts. Two PE frets are also provided namely for the grills as well as the small handles seen all around the BAZ, in total you will need to build at least 40 of these small handles (1.3mm width), luckily Hobbyboss is providing 48 of them, so you can lose a few during the construction. 8 vinyl tires are also provided, they are incredibly well molded and the seam line is almost invisible, tire dimension is accurate and even have well defined rotation arrow indicator present. 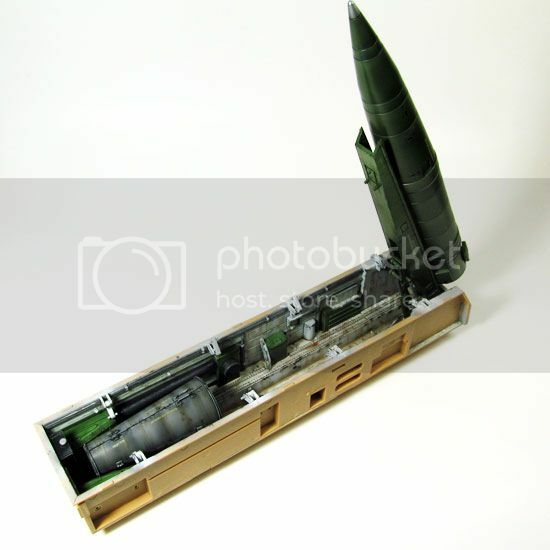 The build can be achieved in 27 steps and there are only 5 steps for the missile and its compartment. The model of the TEL can be assembled in two modes: travel or combat modes. 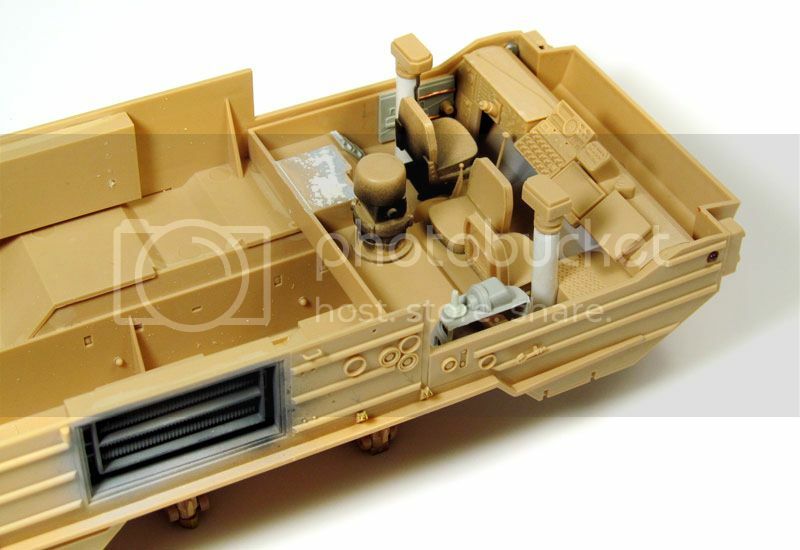 The model is provided with two different camouflage patterns and decals: one from a Russian vehicle, an unknown unit that only has interior markings with no external signage. The other finishing option is for Slovakian vehicle which includes unit decals and nationality insignia. The cabin is represented in two pieces: one for the bottom and one for the top. The cabin is well done with decals for the computer screen, details are really crisp. The painting directions are kind of confusing, so please check reference pictures to accurately depict the finish. According to the photos found on the web, mostly in Russian, the interior is flat white with a green floor. 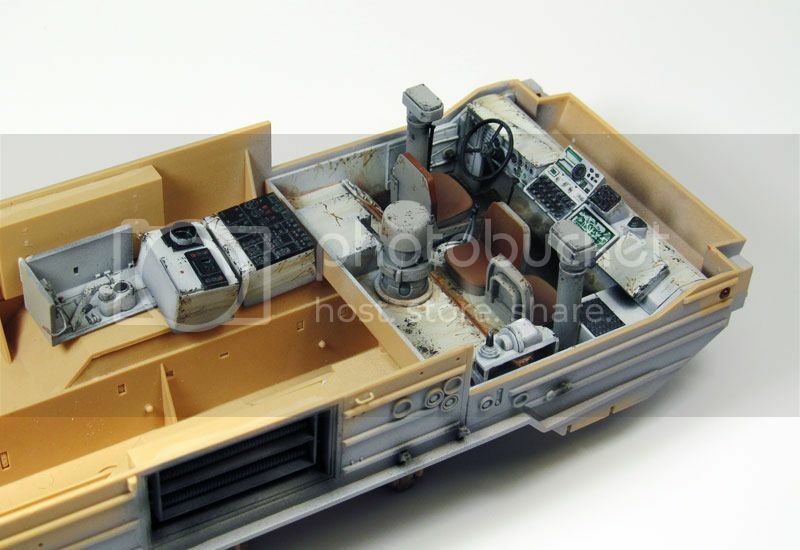 Since it is an amphibious vehicle most of the mechanical parts are hidden inside the hull, so no visible gearboxes, hydraulic lines and compressed air tanks. The undercarriage utilises a minimum number of parts, only the suspension frame (lower and upper A-Frames), and steering rods for the four front wheel. While attaching the suspension, CV shafts are attached from the hull to the steering knuckles. Torsions bars are attached to the hull for all the transmission and reinforced with hydraulic struts. Once these parts are glued to the under body you have half of the BAZ. Numerous handles are attached to the sides of the body. The two hydro jets are attached to the rear of the hull. Since the model can be displayed in two configurations, you need to carefully select the truck outrigger configuration: travel or combat mode. Due to the bulkiness of the wheels, they are constructed with rear half hub that needs to be glued to the knuckle at the final stage to ease the attachment. The bottom part is firstly glued onto the main frame, the top part will be glued later during the assembly at the same time as the missile compartment. The two giant doors are then positioned inside the main frame and finishing the assembly of the vehicle. The two half sections of the missile are glued together as well as the engine parts. The erecting arms with moveable hydraulic jacks are rapidly assembled. The floor compartment is really long and displays numerous antiskid railings. The walls, including numerous electrical lines and electrical panels are nicely detailed. I have to draw your attention on the fact that there are no colours indicated for painting the missile or bay. According to the reference pictures I found on the web, I am recommending Russian green darker than the exterior one (less UV degradation of the paint) for both missile and bay. For the rest of the components such as cables, cylinders, flat black will do the job. The roof is molded in one piece totally flat; no wrapping in my review sample, the piece is pretty stiff for its length. The roof panels and doors are attached to the wall finalizing the assembly on this subunit. I like the overall appearance of the model due to the impressive size. Quality of molding is great and rendition of most detail being nicely done. It is not a complicated build and I will recommend this model for new builders that might enjoy an impressive subject. This model will be a good training model for painting and extended weathering as seen on a lot of models currently. Some will find the subject really boring due to the lack of guns, but it is a big green monster of course. With that said the subject remains an interesting platform for further scratch work. 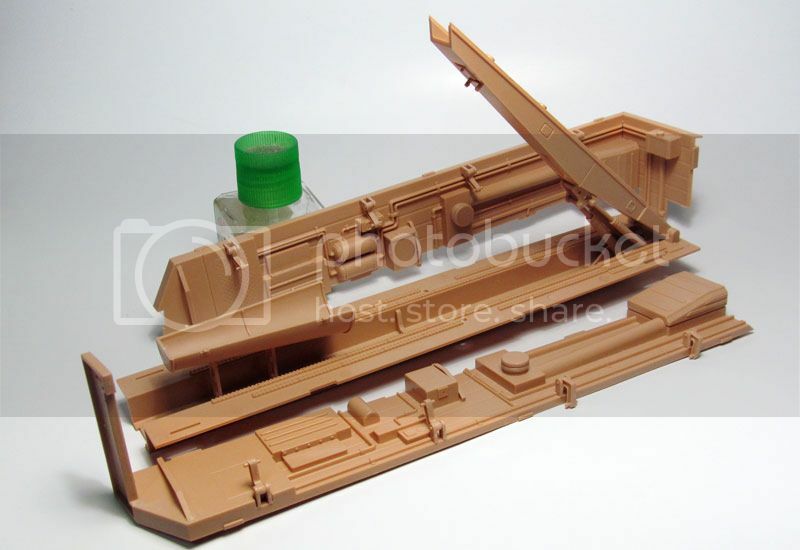 The author thanks Hobbyboss for getting access to review sample and Scientific/MHD the French importer to send me the review sample especially Mr Fontaine. Lows: you will need some workbench space. lack of an interior painting scheme. Not a fancy subject. Verdict: Highly recommended if you like the subject, it can be a boring vehicle for the majority. "it can be a boring vehicle for the majority." really? Hi all, I've started some parts of that kit. I realized the Trumpeter's interior of the cabin be familiar to Miniman's. And the missile bay: Thanks for your informations. Regards, K.
Hello! The middle seat looks backwards. Turn 180°. I picked up one of these last weekend! It looks awesome!